Today's carcolor composition is a close-up view. 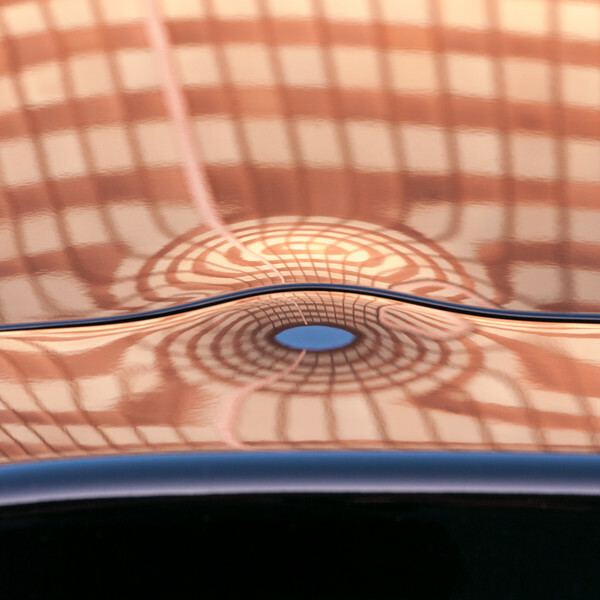 Bumps and convolutions of car bodies distort reflections in fascinating and unexpected ways. The particular detail shown above is the bump that (I assume) hides the articulation of the back door of this particular type of car. The yellowish-orange pattern is the reflection of a building, the dark bottom is the rear window, and the tiny blue spot is the reflection of the sky. I thank you for visiting and hope you enjoy! If you are interested, more carcolor examples are found in my carcolors gallery or in earlier carcolor posts. Turning a metal plate and a regular lens into sort of a fisheye picture ... thumbs up for your carcolor series!